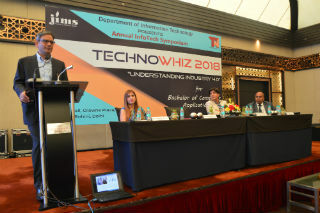 Jagan Institute of Management Studies, Rohini, one of the leading institutions of Information Technology and Management education organized its Annual InfoTech Symposium “TechnoWhiz 2018” for BCA students. 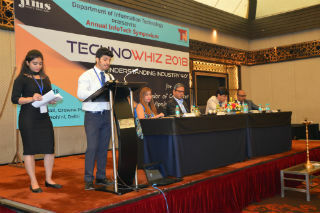 This year the symposium was held on 7th April 2018, at Crowne Plaza, Emerald Hall, Rohini, New Delhi-11085. 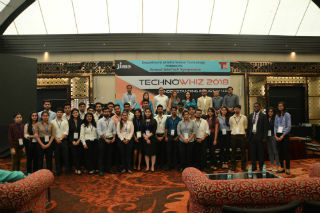 The students and faculty of Jagan Institute of Management Studies, as part of a continuous process of learning through the interaction between corporate, students and academicians annually hold this half day InfoTech symposium from 8.30 a.m. to 1 p.m.
Fourth Industrial Revolution is representing Industry 4.0 or Smart Industry. Industry 4.0 is the contemporary industrial transformation with Big Data, AI, IOT, Robotics, Cloud Computing, Cyber – Physical Systems (CPS) and many more to perceive smart industry. All above are essential components of this industrial transformation through IT. Industry 4.0 is convergence of two unique worlds, i.e. 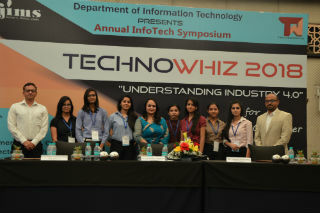 IT & OT which were disconnected so far, into a hyper-connected digital industry. The concept behind Industry 4.0 is that products are finding way in independent process. In the intelligent factories machine & product communicate with each other. Objective is to produce highly flexible individualized & resource friendly optimized mass production with the help of sensors, RFID based Cyber Physical Systems (CPS) which communicate and control each other cooperatively. Cyber Physical Control is important as connecting real with virtual world is done through simulation to maintain quality, efficiency & flexibility. Industry 4.0 or the 4th Industry Revolution with Cyber Physical Systems is still a vision and will become a reality in 15 years from now. In Intelligent factories everything is interconnected wirelessly. The vision is to take the internet down to lowest level, means every sensor & every actuator is participant in IoT. 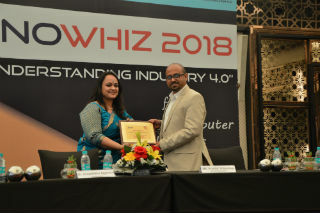 At TechnoWhiz 2018 discussed various aspects of Industry 4.0 and how prepared we are for it. 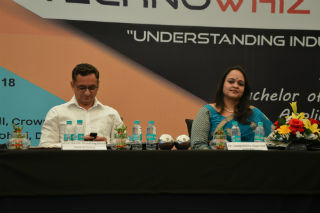 Technical session will focus on various challenges faced by industry while implementing these intelligent solutions. We will also focus on security aspects of this massive industrial shifts. 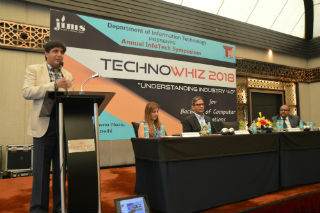 Dr. Praveen Arora, HOD IP Department, JIMS in her Welcome Address discussed about 4 generations of Industry 4.0. 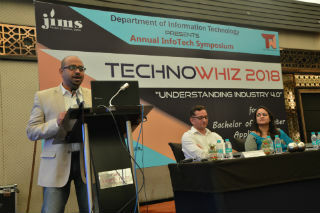 Then Dr. Pawan Gupta, Director, JIMS addressed students about vast growing IT industry. 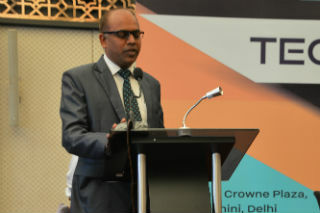 Our Chief Guest Mr. Neeraj, Risk and Compliance Leader, IBM gave Inaugural Address He explained the different aspects of Industry 4.0 and talked about Securing our Installations. 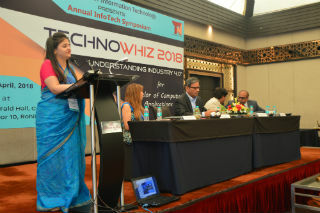 Technical Session –II started with two technical speakers- Lt Col Naresh Chaudhary and Mr. Pranjal Srivastava, and Dr. Deepshikha Aggarwal (Moderator). 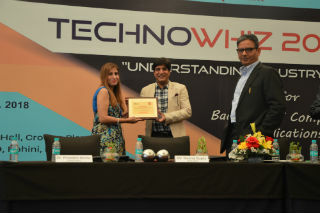 Lt Col Naresh Chaudhary (Retd), Chairman and Managing Director, Council of Information Security discussed about various security concerns in Industry and how we can overcome them. 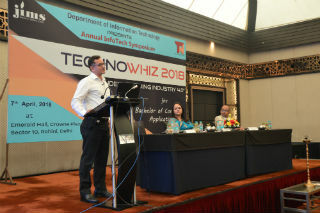 Mr. Pranjal Srivastava, Founder & CEO, CodeFire Technologies (Technical Speaker- II) discussed the new revolution in Industry 4.0.